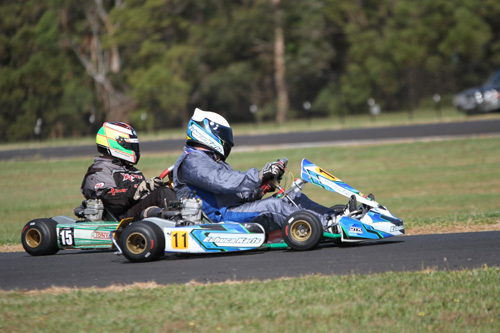 Clear skies and light winds greeted karters to the 966 metre Cobden Park Raceway as the South West Kart Club hosted the 6th and final round of the 2015 AUSTRANS Victorian Country Series last weekend. With over $23,000 worth of series prises and trophies on offer, 130 entries, ideal conditions and still 9 of the 11 class series winners still to be determined, expectations were high for some excellent racing over the two days of the meeting. Home town driver Kyle Rethus showed all local knowledge is so important to qualify in the #1 position. 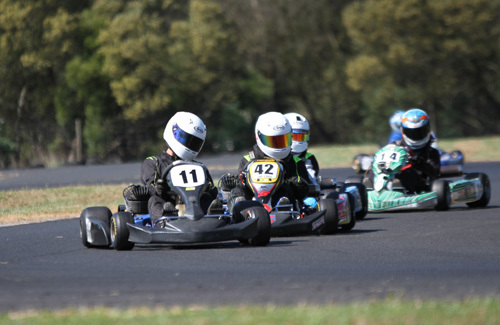 He went on to complete a clean sweep of the class, with convincing wins in both the heats and finals, leaving the rest to battle it out for the minor placings. 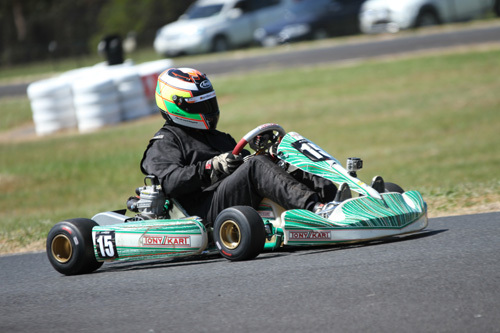 With only 50 odd points separating 1st and 2nd in the series points, it was Portland member Ash Lear that did enough with a second and two thirds to allow him to stand on the top step of the podium for the series win over the Geelong based Karter Bradley Marsh-Stepney who was leading the series points going into this meeting. Only a small field of three TaG entered for the meeting, so these guys ran on the back of the TaG Light field. 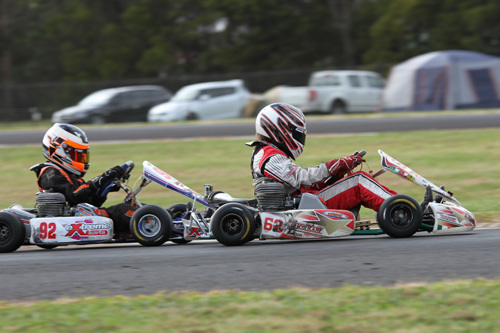 Portland karter Scott King, only having to turn up and cross the baulk line to ensure a series win, again showed his dominance with a clean sweep of the heats and final. Second on the day was Stephen Simpson and Bradley Anderson third for the day. 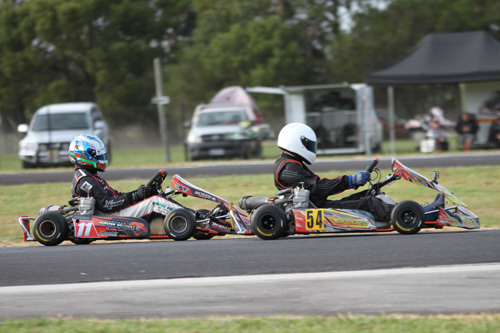 With only 200 odd points between series leader Courtney Prince and South Australian competitor Jackson Rees coming into the last round and 1203 points on offer. It was Jackson Rees that set the pace early qualifying in P1 with Prince in P5, the racing in Junior National light was sure to be fierce. However, it was Jay Coul that showed the field a clean set of heels with a clean sweep in both the heats and the final. This left Rees and Prince to fight it out with 2 seconds and a third Rees could not overcome the 200 point difference to topple Prince (a third and 2 fourths) for the series win shy by just 112 points. Round win went to Jay Coul (Southwest), 2nd Jackson Rees (SGKC) 3rd Jaxson Cox (Geelong). Easily the biggest field for the series again did not disappoint with numbers. With less than 1200 points separating the top six places, series leader Brock Rae would have to work hard to maintain his slender 40 point lead over 2nd place Brayden Flood. It was Flood who had the upper hand going into the heats by qualifying in the #1 position with Rae out of P4 and a lot of work to do over the heats and final. The Cadet 12 class offered some of the best racing seen over the two day event with some very close racing and lead changes across both the heats and the final. With wins in both the heats it looked like the 56 kart of Will Harper had the set up right to take a clean sweep of the event. 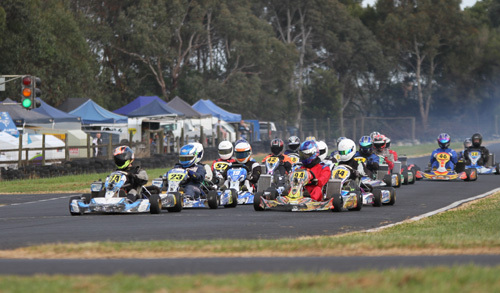 However, on lap 3 of the final the 30 kart of Jobe Stewart took the lead and with the Harper, Miller, Domaschenz and the 71 kart of Boult battling it allowed Stewart to take the chequered flag in the final over Harper and 92 Kart of Matthew Domaschenz. With series winners pretty much decided before the start of the racing in the JNH class, it was all about racing for the round win. Cody Donald qualified fastest, but with Cory Arnett, Michael Clemente, Bryce Woollard and Giles Rogers all showing good pace, it was never going to be easy. 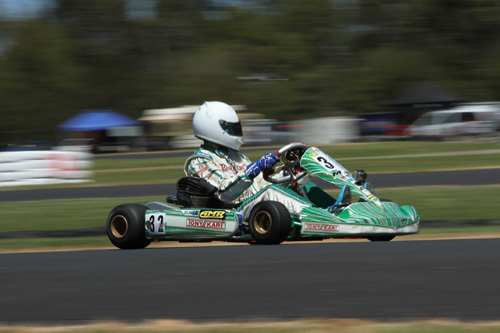 With Remo Luciani a clear series leader in the Clubman Heavy class it was all about the round win for this group of karters. It was Chris Thomas who qualified in the #1 position with Aaron Jackson second with Remo out of P3 for the heats. What was witnessed by the crowd was some of the closest nose to tail racing seen over the weekend especially by Luciani and Thomas. And it also proved that while you might be able to catch him (Remo) it is certainly a different kettle of fish to pass him. 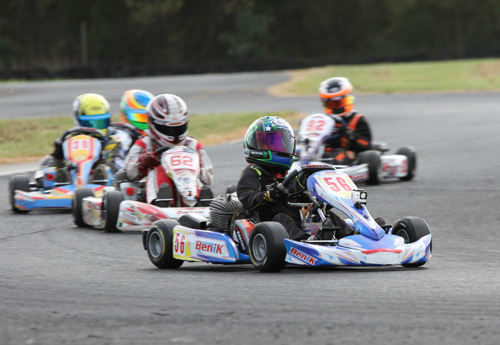 In the end it was a clean sweep by Remo with Thomas in second and the 13 kart of Jackson in third. Only 54 points separated the top three drivers in the series and only 600 points from 1st to 5th. 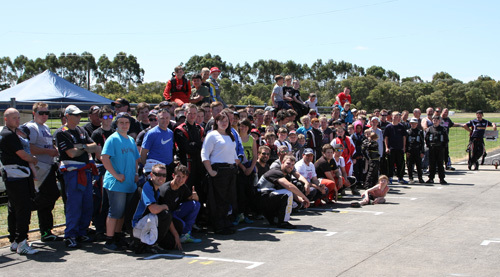 With all these Cadet drivers in attendance, the final round was going to be very important to the winners of the series. And that’s how it turned out. 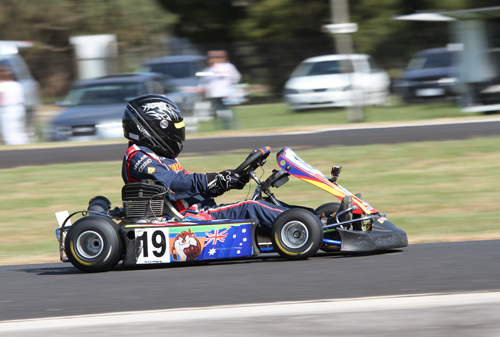 With the 33 kart of Jaxon Johnson claiming the pole for the heats, he drove superbly to take the chequered flag in both from the 15 kart of Christian Cowie and the 88 kart of Joseph Fawcett. 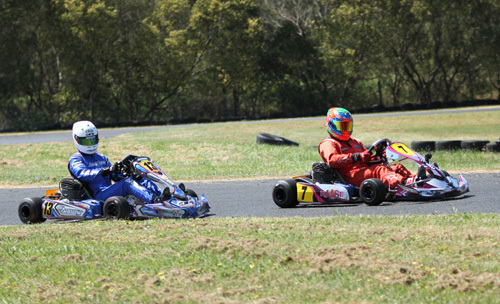 In both the heats you could have thrown a blanket over the first five karts across the line. Some exceptional racing shown by the young guns. In the final however it was Cowie who turned the tables on Johnstone to take the round win with Johnstone in second and the 88 kart of Fawcett in third. Another class that the series leader would be determined by the drivers performance in the final round. 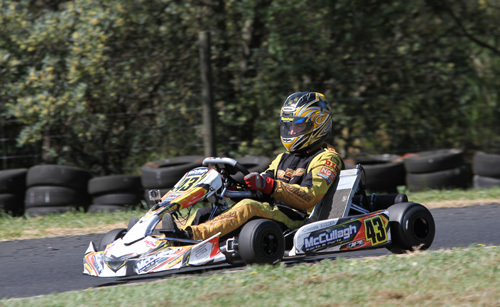 It was Cody Donald setting the pace in qualifying followed by Dylan Hollis and series leader Benjamen Delaney. It would be these three who would battle it out for the top points in the heats and final. Hollis took the honours in heat 1 over Donald after Donald made a nice pass on Delaney in the latter stages of the heat. In heat two it was a Donald’s win from start to finish, this time Hollis relegating Delaney to third and certainly not helping his series points. In the final the order never changed even though the racing was close – it was Donald 1st (JNH and JC Double) Hollis 2nd and Delaney 3rd.